Looking for an easy to make Halloween cupcake? Here are two of my favorites that are sure to impress. 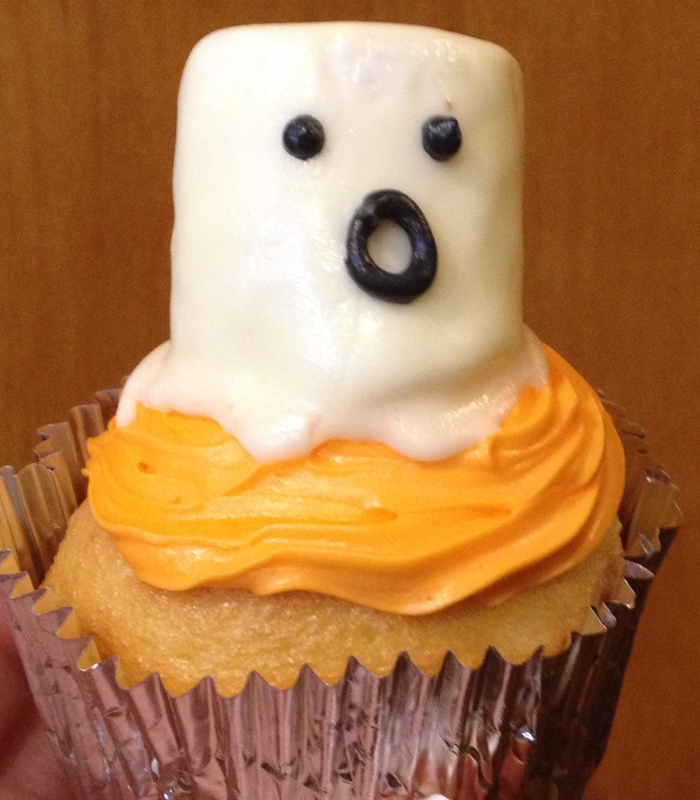 To make boo cupcakes you need a box of cake mix, a bag of marshmallows, two cans of vanilla icing(or you can use your own buttercream from scratch), orange and black food coloring. Bake the cupcakes as you normally would. To make the base color one whole can of icing orange. You could use a spatula to ice the cupcake. I used a number 18 Wilton decorating tip to create the base. Either way will work. Then spoon about 1/3 of the icing into a cup and melt in the microwave for 20 seconds. When the icing is melted use a toothpick to dip the marshmallow into the melted icing and place on top of the cupcake. After take a small amount of icing and color it black. Use a number 3 Wilton tip to pipe the eyes and the mouth. You could also use the gel colors that they sell in the baking aisle to create the same effect. Wait for the icing to harden before you put the finishing touches on the ghost. 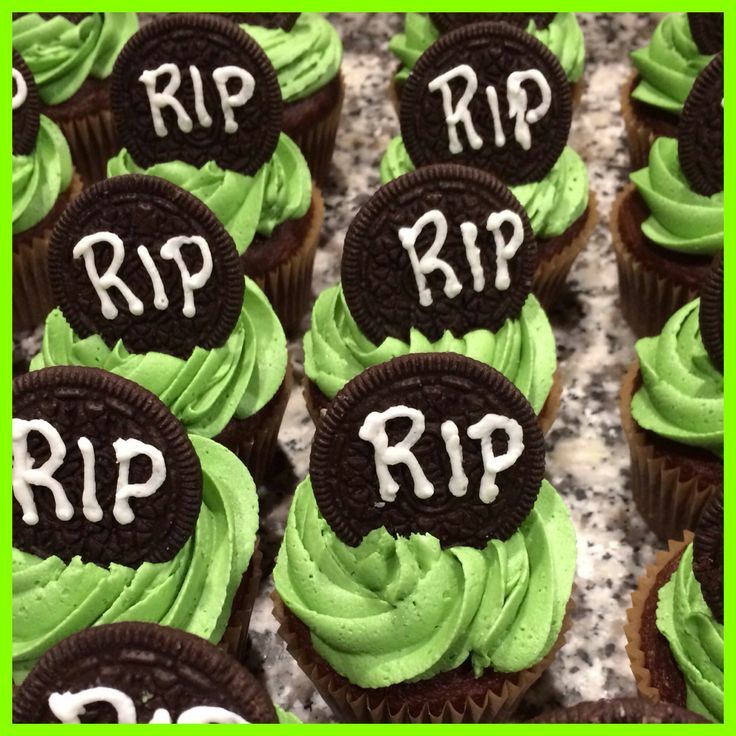 To make graveyard cupcakes you need a box of cake mix, a package of Oreo cookies, can of vanilla frosting(or you could use your own buttercream) and green food dye. Use the green icing coloring to tint the vanilla icing green for the base. Save some of the white icing to write the RIP on the gravestone. Use an icing bag and a Wilton decorating tip 1M to cover the cupcake. Start on the outside of the cupcake and swirl in towards the center. Take the Oreos apart and scrape center icing off the cookie- My kids thought this was a crime! Stick the cookie half into the cupcake to create the gravestone. To decorate the gravestone use a decorating bag and a Wilton #3 tip and pipe the words RIP on the gravestone. This entry was posted in Cakes & Cupcakes, Family, Food & Snacks, Holidays, Recipes and tagged Betty Crocker, bettycrocker, boo cupcakes, Cupcake, cupcake decorating, ghost cupcakes, graveyard cupcakes, Halloween, icing, vanilla icing, Wilton. Bookmark the permalink. Summer Is Not Over Yet... Adventureland Fun! Leap Day… What will you do with your extra day? Which Literary Monster Are You?